No wonder they don’t like that advice. I don’t like it either. In some ways it seems like years since my wife Monica died in January. In other ways, it’s only yesterday. And that timeline can shift at any moment, with no apparent regularity or rhythm. Even before her death there were family, friends and hospice professionals who would ask me if I was going to write about grief. I told them maybe. Not right away. Even then I knew that I knew too little about it. Truth be told, I probably liked not knowing. Now I’m sure I don’t know much as I fumble my way through this first year as a widower — a term that initially had more than a little sting to it. Being a writer, I wanted these 12 months to have a label or a theme. A rookie year. A novitiate. A retreat. A pilgrimage. — A pilgrimage implies movement. I can’t stand still, although some days I spend a good deal of time resting. Grieving can take a surprising amount of energy even when I feel as if I’m accomplishing so little. — I’m making my way through unfamiliar — sometimes foreign — surroundings. Now I write the checks for the monthly bills. Now, in the evening, the house is very quiet. — There are stops, stations, along the way where I pause and pray and consider. Remember and grieve. Realize how my life is still so richly blessed and give thanks. Places that bring tears and places that spark laughter. — I meet people. Some are new pilgrims like me, others are guides who have been on this path for a long time and remember their first few weeks, months, years. All of us have a similar story to tell but each story is unique. — I need daily nourishment. Yes, food for physical health but also professional help and the help of family and friends for emotional and spiritual health. The grace of God through the sacraments and through his presence in others. — Day by day, and night by night, I take step after step. Often small steps. Baby steps. Looking back I can see I’ve traveled some distance. Looking around, I can find myself once again in a spot, in a place, I had visited weeks or months ago. It’s a winding, circling, confusing path, and I don’t know where I’m going even as my faith tells me, tries to assure me, that God is with me every step of the way. He’s leading me and guiding me and this painful journey is important. And how do I become better at having faith? As with patience, it’s by having faith. I’ve found it helpful and comforting to spend a few minutes in the evening going over the Mass readings for the next day. They’re available on the U.S. Conference of Catholic Bishops website: www.usccb.org/bible/readings. 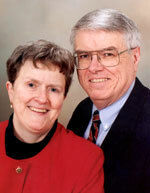 Bill Dodds and his late wife, Monica, were the founders of the Friends of St. John the Caregiver (www.FSJC.org). Bill is the editor of My Daily Visitor magazine and his latest novels are “Pope Bob” and “The World’s Funniest Atheist.” He can be contacted at BillDodds@YourAgingParent.com. PREVIOUS: What does God want?